Youngstown State’s shooting was cold and they paid the price as the visiting Detroit Titans pulled away to a 22-12 lead midway through the first half. But the Penguins finally began hitting their shots and with 6 minutes left in the half they tied the Titans 27-27. But with Detroit hitting 54% of their shots, the Titans finished the half ahead 36-34. PF/C Morris Phelan, SG Matt Angner, and C Will O’Neil all had 7 points for the Penguins while C Walter Beerbohm poured in 13 for Detroit. With 17-1/2 minutes remaining, YSU took it’s first lead of the game when PF Lee Pauly put back a rebound to make it 41-40. Turnovers by the Titans took their toll and YSU slowly stretched out their lead. With 9:30 to go, the Penguins were ahead 60-46. YSU then went ice cold for the next 4-1/2 minutes during which their lead shrunk to 60-54. With 58 seconds left and YSU leading by a score of 66-61, the Penguins missed yet another shot and Detroit rebounded and called a time out. The Titans worked the ball inside to Beerbohm but with Will O’Neil guarding him closely, Beerbohm missed a short jumper. O’Neil pulled down the rebound and tossed the ball out to Pat White who was fouled intentionally. White sunk both free throws putting the Penguins on top by 7 with 44 seconds remaining. Following a missed 3 by Detroit, Colin Chambliss was fouled with 18 ticks on the clock, and he also knocked down both foul shots. After a quick miss by Detroit, the Pat White threw up a 3 that went in to give Youngstown State a 73-61 victory. With the win, the Penguins Horizon League record improved to 10-4 as they drew within a game of league-leading Detroit. Even though YSU shot poorly, their 21-7 advantage in turnovers proved to be the difference. Leading the scoring for Youngstown State was C Will O’Neil who finished with 16 points and 8 rebounds. PG Pat White had 12 and SG Matt Angner scored 10. C Walter Beerbohm and SG Dwayne Poge both scored 13 for Detroit. Oakland jumped out to a 7-point lead early in the game, but the Phoenix cut their lead to 35-33 at the halftime break. Then in the 2nd half, Wisconsin-Green Bay began hitting their shots while shutting down Oakland’s offense and controlling the boards and ran off to a 21-point lead. The Golden Grizzlies cut into their lead late in the game but the Phoenix came away with their 3rd straight upset victory, taking the championship 73-60. C Jamil Weekes continued to lead the way for Wisconsin-Green Bay with 16 points and 8 boards. C Rasheem Dorsett hit for 13 for Oakland. 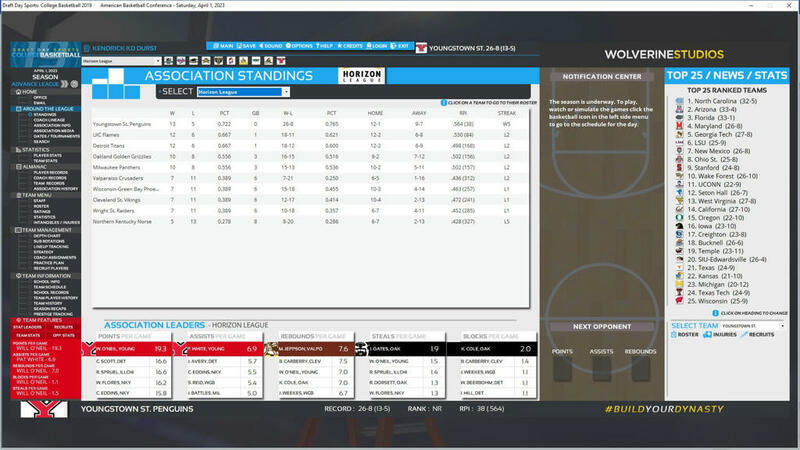 The upset wins by the sub-.500 Wisconsin-Green Bay Phoenix (now 14-17) were amazing but likely mean that they will be put in a play-in game with the winner tabbed to take on a #1 seed. 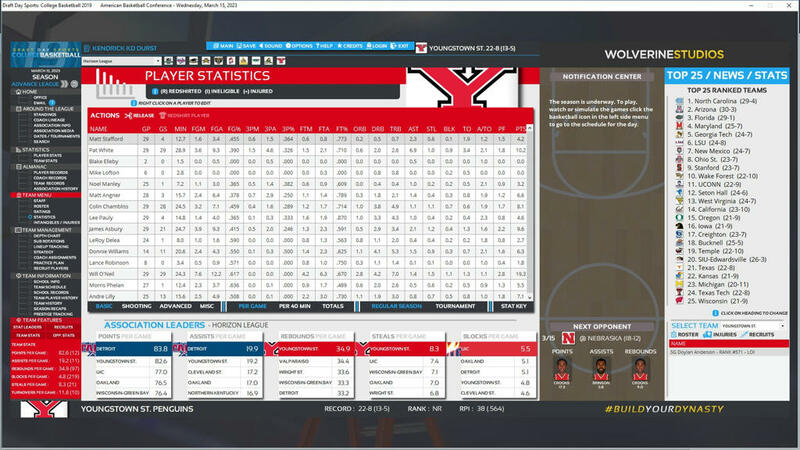 Now that the regular season is over, the 2022-2023 Penguins' stats were dominated by C Will O'Neil and PG Pat White but a closer look shows contributions by nearly everyone on the team. On Selection Sunday five teams from the Horizon League were selected for the four post-season Division I tournaments. Wisconsin-Green Bay plays Campbell in a play-in game for a #16 seed. Coach KD Durst said, "After not winning the Horizon League tournament, we realized we wouldn't be returning to the NCAA tournament. But we're happy to be a part of the NIT tournament and want to make some noise within it."